At its Executive Committee and Annual General Meeting in Copenhagen on September 20, 2014, ICMA was pleased to announce the appointment of a new General Secretary – The Very Rev Richard Kilgour presently serving as Provost of the Episcopal Cathedral in Aberdeen, Scotland. Mr. Kilgour will begin in January 2015. Fr. Bruno Ciceri Chairman of the ICMA Executive Committee welcomed the news as ‘a significant first step for ICMA in implementing its strategic plan over the next four years’. On appointment, Mr. Kilgour will bring combined personal experience in serving as a British Merchant Navy officer, with a life in ordained ministry and ecumenical mission in major industry. 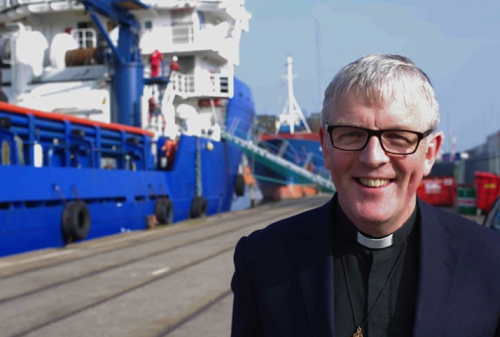 In recent times Mr. Kilgour has been involved in planning seafarer’s welfare ministry in Scotland with The Mission to Seafarers Scottish Council, and also the governance of The Scottish Episcopal Church at national level. As a senior churchman in his cathedral post he has been involved in Scottish-USA links with Aberdeen and organising contributions to the ecumenical life of the churches in the city. On the prospect of leading ICMA Mr. Kilgour has said, ‘At a time where challenges to meet the welfare needs of seafarers are continually increasing, the ICMA membership organisations provide welfare services for Seafarers and Fishers at the point of need across the world. As our membership organisations are often the only local agency of human ‘first response’ for those in need, we must continue to share skills, knowledge and resources. We strive to build and grow essential and productive partnerships with welfare agencies for work of common concern for seafarers with particular reference to the Maritime Labour Convention, 2006’. ICMA is excited that Richard Kilgour will continue to focus our efforts in delivering our mission and vision.